Remember the last time you moved? Was it a fun. A family bonding experice? Doubfully. Moving and selling your home can be stressful and overwhelming. Moving a loved one or family member from their home can present more challanges. We want to help with some tips to help decide what size dumpster you may need to alleviate the stress of moving day. There is no better time to get rid of the clutter and junk than right before you list your house for sale. One of the most powerful ways to make buyers want to buy your house can be as simple as decluttering and getting rid of the junk. 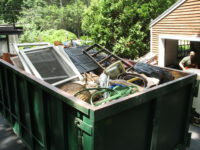 A common theme with homeowners is to rent a dumpster before listing the home to stage it better. At moving time evaluate weather you need another dumpster or a small junk pickup. You have to clean up the attic and basement anyway. Do it before the open house. Make it look nice. Saving those hard to reach areas for moving day will create stress. If you want the best offer for your house make it look nice. Did someone say donations? We would be happy to arrange pickup of your gently used household items. We offer free pickups of gently used house items in select cities and towns. All items are donated and donation receipts provided. When is the best time rent a dumpster for a move? We would recommend renting a small dumpster before you list your home for sale. Show your house at its best, free of clutter and junk. If you want better offers from buyers get rid of the junk and clutter before listing your house. When it is time to move a second small dumpster will help. No need to move the old mattress and box spring, the lumber behind the shed or all the junk in your junk drawer. Label everything. Kids room, living room, even dumpster and donations. Don’t pay to move junk and clutter. Start life in your new home organized and junk free.